In a large bowl, combine the dry ingredients. Combine the vegetable oil, honey and vanilla in a small saucepan and heat just until warm. Stir the liquid into the dry ingredients and mix thoroughly. Pour the mixture onto a jelly roll pan and place in oven. Bake for 60 minutes, stirring every 10-15 minutes. Allow to cool completely before storing in airtight plastic bags. Makes 6 cups. **: We have recently found that unsweetened coconut is a good substitute. We used 3/4 cup unsweetened shredded and 1/4 cup unsweetened flakes to make a granola that is less ‘sweet’ and lower in fat. Preheat oven to 350°. Wash squash and cut in half. Remove all seeds and pith and place squash cut side down on a jelly roll pan covered with a Silpat or parchment paper. Roast squash for 1 hour, or until very tender (test with knife inserted into squash half). Cool just enough to handle and remove peel from squash and discard. Set aside. In a 3 quart saucepan over low heat, melt butter and sauté diced onion just until soft. Add grated ginger, salt and pepper to taste. Add dry sherry and reduce for 5-8 minutes. Stir in roasted squash until incorporated with onion mixture. Slowly add broth whisking until smooth. Add milk and cream and heat through. 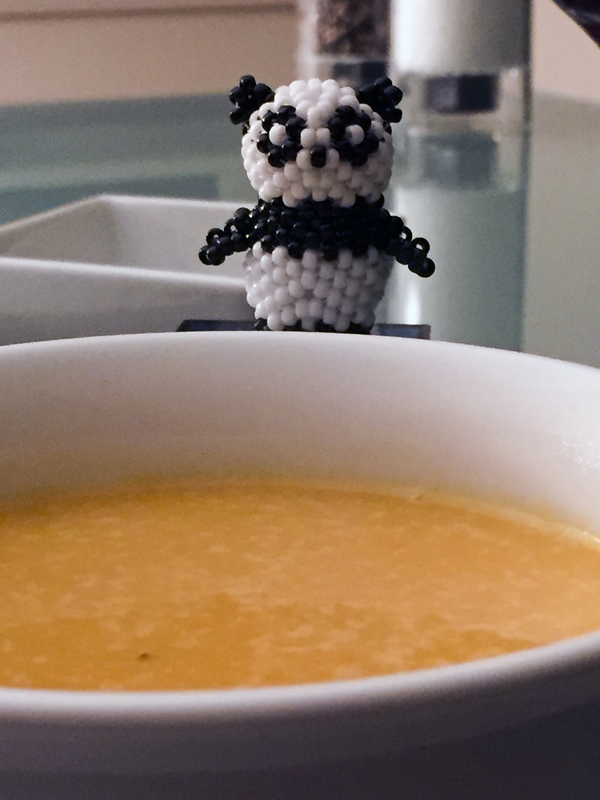 If soup is too thick, add more broth to reach desired consistency. Serve with toasted pumpkin seeds and dry sherry if desired. Combine all ingredients for salad dressing and refrigerate. There will be enough dressing left for more salads. Preheat oven to 450°. Once oven is heated, place the 1 TB olive oil in a cast iron skillet, heat and add chickpeas and hot smoked paprika. Toss over medium high heat until completely coated. Roast in oven for 20 minutes. Wash and dry kale, remove stems and thinly sliver leaves. Place kale in large bowl, sprinkle with a tiny bit of sea salt and gently massage leaves for a couple of minutes. Add salad dressing just to coat. Add chickpeas and if needed, a bit more salad dressing, again just to coat all ingredients. Serve immediately. 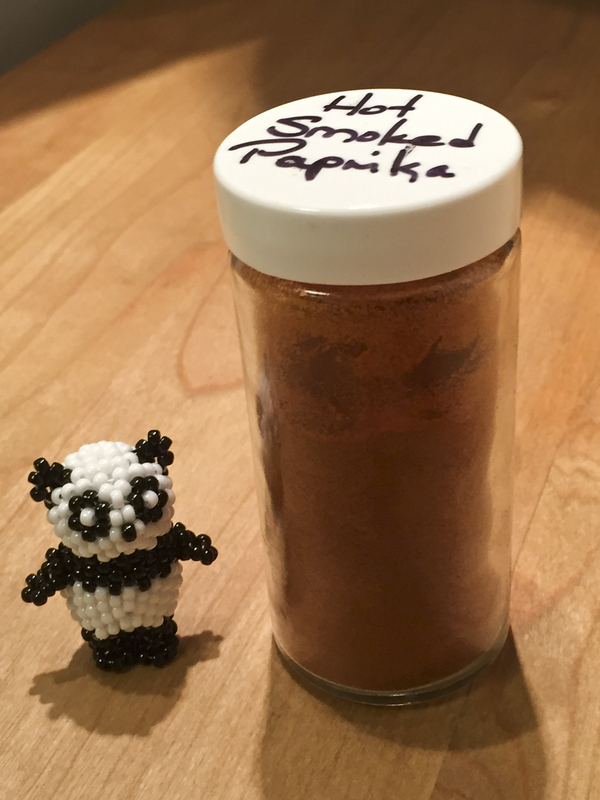 *Heat may vary by brand, so perhaps start with ¼ tsp of hot smoked paprika the first time. This ingredient is crucial to the overall taste of the dish. Preheat the oven to 375°. Coat an 8-inch square baking dish or 9-inch deep dish pie plate with cooking spray. In a small bowl, mix together 1/2 cup of the pecans, 2 tablespoons of the coconut, 1/4 teaspoon of cinnamon, the brown sugar and a pinch of salt. In a medium bowl stir together the oats, baking powder, the remaining 3/4 teaspoon of the cinnamon and the remaining 1/2 teaspoon salt. In another bowl whisk together the milk, maple syrup, egg, oil and vanilla. 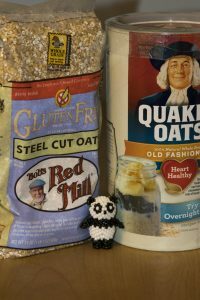 Pour the liquid ingredients over the oat mixture and stir to combine. Stir in the remaining 1/2 cup pecans, remaining 2 tablespoons coconut, apple, carrot and raisins. *Rather than cut up the apple, we shredded it along with the carrots. Pour into the prepared baking dish. Top with the pecan-coconut mixture. Bake for 40-45 minutes, until it is set and the top is golden. 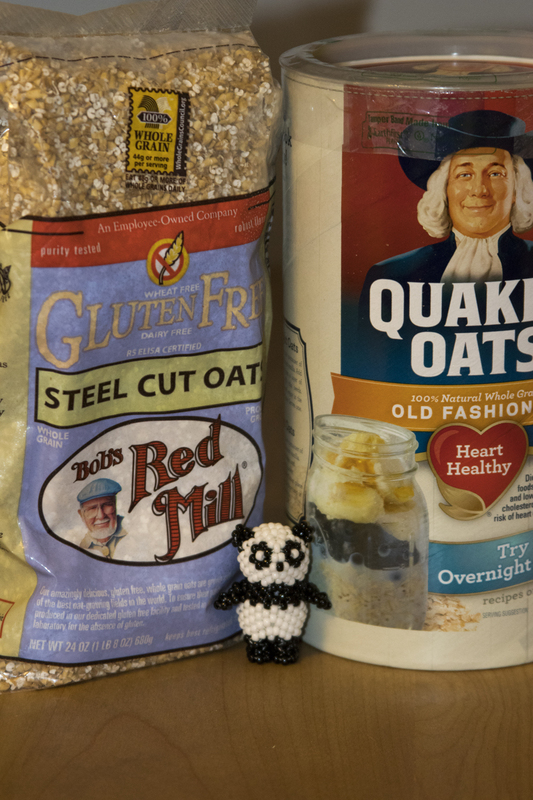 MAKE AHEAD: The baked oatmeal can be refrigerated in an airtight container for up to 4 days. Cover with foil and reheat in a 350° oven for 20 minutes, or microwave individual portions on HIGH for 1 minute. Combine vinegar and mustard in a small container; slowly add olive oil while mixing** to make an emulsion. Season to taste. When a recipe calls for just a few ingredients, use the best quality available. My preferred champagne vinegar is “O” and when I am very fortunate, I have olive oil from Chile (thank you Marcelo and Gisela) to use in this recipe. ** A small battery-operated whisk by Bonjour (https://smile.amazon.com/BonJour-Stainless-Hand-Held-Battery-Operated-Beverage/dp/B001DJ0ZU2/ref=sr_1_sc_2?ie=UTF8&qid=1483030563&sr=8-2-spell&keywords=bon+jour+battery+operated+whisk) is perfect to quickly mix the dressing. Steam the broccoli just until crisp-tender and immediately run under cold water. Drain and dry on paper towels. In a small skillet, heat the olive oil and add the bread crumbs. Saute until golden brown. Combine the crumbs with the cardamom and salt. To serve, put bread crumbs in one small bowl and yogurt in another. 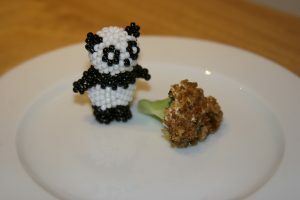 Dip broccoli in sour cream and then bread crumbs. This is an incredible recipe and when we make our breadcrumbs, we prefer using whole wheat bread or a fresh baguette from Bread Furst. Preheat oven to 375°. Lightly oil a 12 inch cast-iron skilet. Saute onions and celery in 1/4 cup oil over medium heat for about 10 minutes, stirring occasionally. Add zest, salt, garlic, pepper, thyme, and red pepper flakes. Continue to saute until onions and celery are soft and translucent, about 5 more minutes. Remove from heat. Stir in parsley and set aside. Rub chicken on both sides with olive oil; season with pepper and salt. Layer bread (fit pieces together snugly), onion mixture, and then chicken in lightly oiled pan. Pour lemon juice over the chicken and roast, uncovered, for 1 1/2 hours, or until golden brown (at least 165°). Check for doneness during last fifteen minutes. Remove from oven; let stand for 10 minutes. Note: To butterfly the chicken, first remove the backbone with kitchen shears, then flatten it so it’s spread out. Preheat the oven to 450°. In a large roasting pan, toss the kale, potatoes and onion with the olive oil and hot smoked paprika. Season with salt (optional) and pepper and spread in an even layer. Place chicken (if using) over veggies. Cover the pan with foil. Roast in the upper third of the oven for 20 minutes. 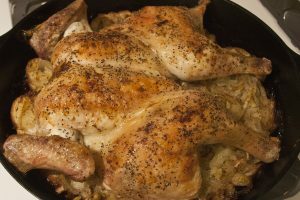 Remove the foil and roast for 30 minutes longer, until the chicken (if using) is cooked through and the vegetables are tender. At this point, everything should be cooked through with some caramelization on the potatoes and onions with kale crispy around the edges. Preheat oven to 325°F. Place Silpat or parchment paper on a jelly roll pan. Combine honey and next 4 ingredients in large bowl. Stir to blend. 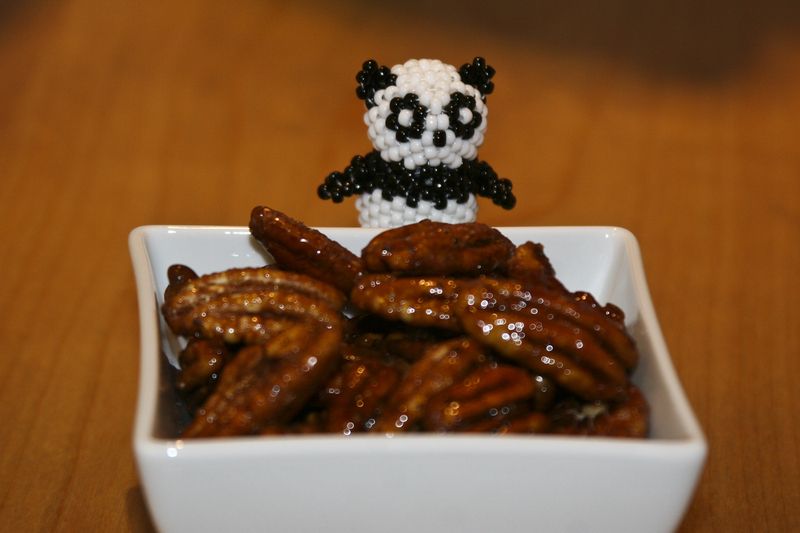 Add pecans; stir gently to coat. Transfer to baking sheet. Thirty minutes before you’re ready to coat and bake the eggplant, you’ll need to “salt” them. We generally place the slices on a large cutting board, salt, cover with a second cutting board and place a heavy weight on top. Let the eggplant sit, undisturbed, for 20 minutes. Remove the weight, and don’t worry about the brownish liquid that has collected on the slices—that was the goal. Transfer the eggplant to a colander in the sink. Run cold water over the slices, making sure to rinse off all of the salt. Lay the slices on a double layer of paper towels. Blot to dry thoroughly. Meanwhile, preheat the oven to 475°F. Top a jelly roll pan with either a Silpat, or parchment paper. Place the flour and breadcrumbs on separate sheets of waxed paper. Add the eggs and pepper to a bowl, and beat with a fork to combine. Coat each slice of eggplant as follows: gently press into the flour, flip and gently press again to coat both sides. Dip the slice in the egg and lightly coat both sides, shaking off any excess egg. 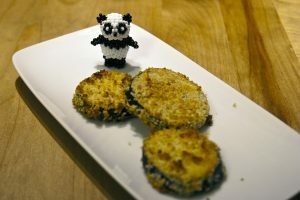 Dip the slice into the panko, using your fingers to brush some crumbs on top, and gently press the eggplant so the crumbs stick. 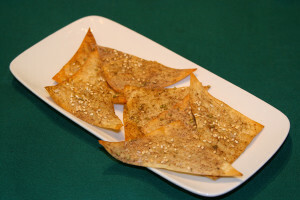 Place the fully-coated slice on the prepared baking sheet. 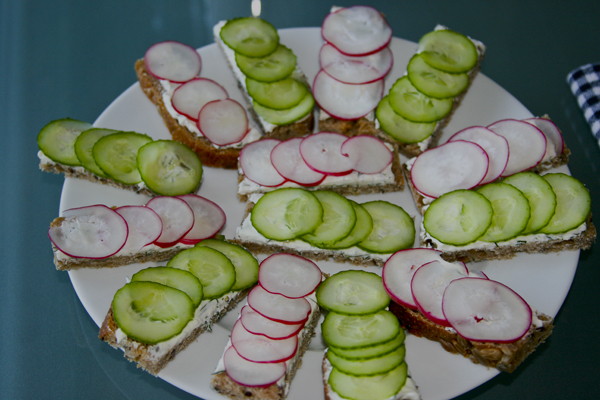 Drizzle the slices very lightly with olive oil. Bake for 20 to 25 minutes, turning halfway through, until golden on both sides. Serve immediately. 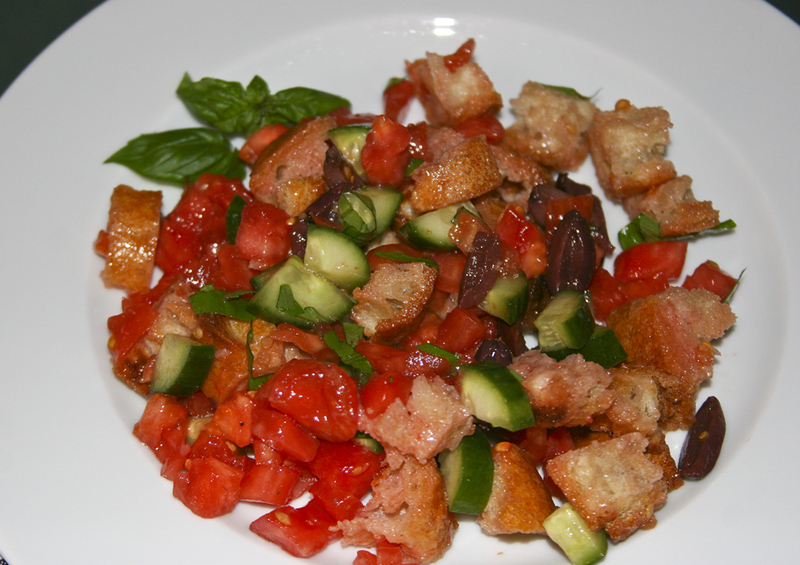 This recipe also can be found in Crispy Eggplant Recipe. We rarely eat potatoes, so when we have them it is important that they are perfectly cooked. 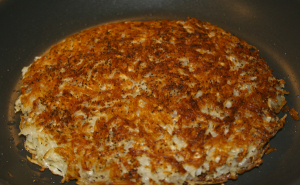 In this case, we wanted something to have with a salad for dinner and since we had a few potatoes on hand, we turned to the very basic potato pancake. With just four or five potatoes (red in this instance), some olive oil, and salt and pepper, you can create something this lovely that tastes terrific. This really isn’t a recipe, but as simple to execute as it is, a dish we should think of a little more often. Peel and grate potatoes on large holes of a box grater (best done on a cutting board with an edge). Squeeze as much liquid from the grated potatoes as possible. Heat a couple of tablespoons of olive oil in a large non-stick skillet, add grated potatoes and sprinkle with salt and pepper. Push the potatoes into a circular shape with a spatula, and cook over medium-low heat for ~15 minutes. Resist the urge to cook this quickly… Place a plate on top of the pancake, carefully turn pan over so that the pancake is on the plate, then slide the pancake (uncooked side down) back into the pan. We should have taken a video of this process which looks somewhat terrifying, but works very well. Continue to cook the pancake for another 15 minutes. At that point, you can check the internal temperature with a kitchen thermometer and if it is at 210 Fahrenheit, you are probably ready to slide it out of the pan. The result should be a crispy crust on the outside and creamy, perfectly cooked potatoes on the inside. The sudden change in DC weather prompted us to pull out a recipe we haven’t made in months and once more applaud the convenience of having a fabulous new bakery in our neighborhood. 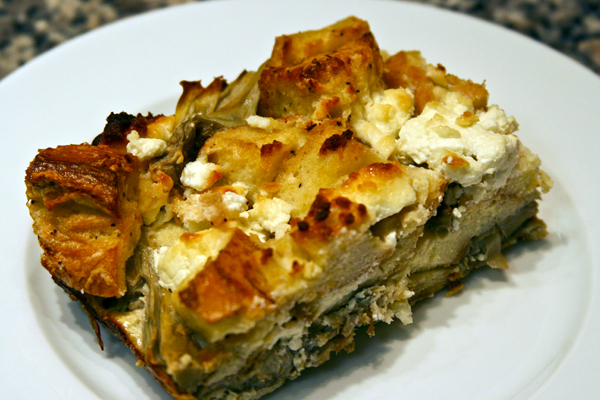 Armed with another beautiful baguette from Bread Furst, we went into the kitchen and put together this Artichoke and Goat Cheese Strata. The recipe probably should be re-named since we have also made it with feta in place of the goat cheese and enjoyed that version just as much. We did have goat cheese on hand, so that is what we went with this time. In making this recipe once or twice, we have found that getting some color on the artichoke hearts does make a difference in the taste of the dish. It might be easier to brown the artichoke hearts, remove them from the pan and then saute the shallots or onion before proceeding. This recipe makes a lot for two people, but it is just as good leftover with a quick trip into the microwave, so another win in the “cook once, eat twice” category. Enjoy and depending on what the weather does next, we will either post more summer recipes, or really move into fall options. Even though the calendar says “fall”, we are still having full blown summer in DC. As we were taking our early morning walk to the zoo, it occurred to us that we haven’t made one of our favorite summer dishes, panzanella (or bread salad) in a very long time. As we talked about this lack in our diet, we decided that at least one reason must be the fact that we have not had the perfect bread on hand for the recipe. It is well known that when a recipe consists of only a few ingredients, each one must be perfect. Luckily, there is a new bakery in our neighborhood, Bread Furst, and they are turning out some amazing products and if they were next door rather than a couple of blocks away, it would be a major diet hazard for us. When they opened, we immediately became addicted to the English muffins that are made fresh daily and as they expanded their ‘menu’ we moved on to try some of their new offerings. Since they continue to expand their list of breads and prepared dishes, there is the potential for a lot of experimentation in our future. We stopped by the bakery on Saturday and picked up a beautiful baguette for our salad. To that we added delicious ripe tomatoes and Persian cucumbers from Twin Springs Fruit Farm along with some basil that was grown on our tiny balcony. Aside from the vinegar, oil and Kalamata olives, we know where all of our ingredients come from, and they are produced by people whose lives are dedicated to growing and baking the very best products to share with their customers. Thanks to all of the wonderful farmers and bakers in the area; we are so fortunate to have so many delicious choices when we shop! The recent arrival of “Joe’s corn” at the Twin Springs Fruit Farm market triggered a discussion at our house of the vegetables we ate as children. The two of us have very different experiences in that realm since one of us lived in the desert where there was no garden and little in the way of truly fresh produce in the stores while the other grew up in North Carolina in a family with a large garden so that veggies were a big part of the daily menu. People laugh about the concept of putting a pot of water on the stove top to boil, walking into the garden, picking the corn, shucking it, putting directly into the pot and then taking it to the table; but that did happen on a daily basis when corn was in season. And if you didn’t grow up with a father who dedicated a lot of his waking hours to tending and caring for his numerous tomato plants, your appreciation of that perfect, ripe tomato may not be as highly refined as some. In contrast, gardens in the ‘suburbs’ outside of Las Vegas, Nevada were generally filled with rocks or cactus and therefore vegetables were found in the frozen food section of the grocery store or, in the case of several friends, on the store shelves … in cans. Dinners with Birds-Eye corn, carrots, peas, or green beans along with iceberg lettuce salads, a starch and a main course were the norm until we moved east. Needless to say, it was a bit of a shock to move to rural Virginia where the first order of business in the summer was to till the garden spot and plant our small collection of fruits and vegetables. If we were lucky enough to fend off the squirrels, raccoons and deer, we got to enjoy watermelon, cantaloupe, tomatoes, cucumbers, string beans… Most of the time however, these were rare treats and we continued with the frozen varieties. Our love of farmers’ markets spans many years and different geographical locations, but in each case you quickly learn which farmers grow the things that appeal to you. Even when we visit a multi-vendor market, we may buy tomatoes from one person, but corn from another. Over time and with some experimentation you get to know who is growing that perfect tomato that appeals to you, or the juiciest peach, or the cantaloupe with the best flavor. Today’s recipe is one we have been making for years, but it can only be made at the height of summer. If the corn isn’t perfect and the tomatoes and green pepper aren’t at their peak, you should plan to fix something else. 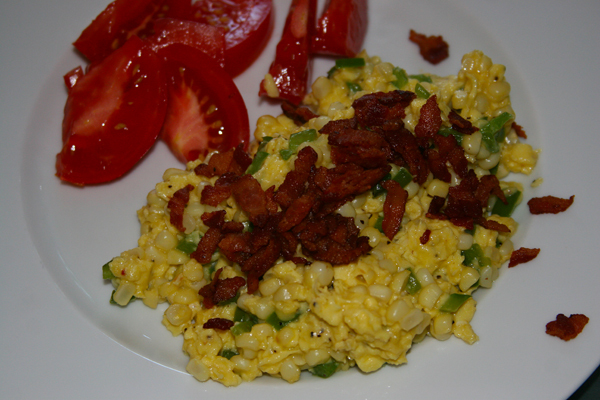 Kentucky scramble is a fabulous brunch dish or at our house, a great dinner. All those beautiful veggies plus bacon? What more could you want? After what seemed like the winter that would never end, we are moving rapidly into summer; which means it is perfect for dinner on the deck of our building. Buildings in DC are not particularly tall given the regulation that no building can be taller than the Washington Monument (and our building is among the “shorter” ones since we are on a ‘hill’), but since we are at one end of Rock Creek Park, it is a great place to sit and enjoy the warm weather. We recently joined neighbors for an informal dinner and one of our contributions was a favorite appetizer, dried apricots topped with goat cheese, rosemary and honey. Easy and delicious! 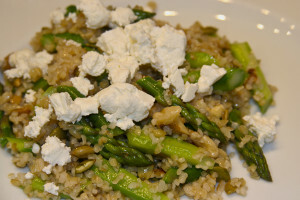 We also offered a new favorite, a Bulgur Salad with Asparagus, Feta and Toasted Walnuts. This is the perfect salad to transport since there is really nothing in it that will spoil and the components can be packed separately and stirred together once you reach your destination. The recipe came from www.food52.com, which is a site that has provided several good recipes in recent weeks. Wherever you live, we hope you will find a wonderful venue and some great weather to enjoy a meal outdoors! Any time you are with friends enjoying a meal, bring up the topic of “was your mom a good cook?”, and get ready for a range of responses. Each of us has food memories from childhood even though few are likely as memorable as those recounted by the wonderful food writer, Ruth Reichl in Tender at the Bone. Unlike the mothers we’ve heard about (and experienced), not many are referred to as “the notorious food-poisoner known as the Queen of Mold”. We all seem to survive growing up no matter how much expertise the person in the kitchen had during those formative years, but few stories can top one that was shared with us recently. Gary (whose last name will not be shared in order to protect him from his mother’s possible wrath) was kind enough to put this down for us and it is an amazing example of someone who managed to grow up and eventually enjoy food despite the things that appeared on the family table during his youth. “I come from white trash origins, and after years of therapy and experimental diet drugs I now can admit this with pride. As a result of my background, I have had several of moments of enlightenment in my life. One of these was discovering food (which explains my weight). Yes, I did have access to food growing up, but I didn’t get it. I simply found eating a waste of time and longed for the days when food would be simply marshmallow-sized bits of primary colors like they ate on Star Trek. Food at home to me was like taking medicine. My mother was not a good cook, and to her credit she never claimed to be good at it or like it, but she did it. She mostly cooked by color. She would get a recipe and make it but if the ingredients were exotic (like calling for tomato paste) she would have to improvise. This meant finding, from the 101 varieties of Campbell’s soups that stocked our pantry, the one she felt was the most suitable substitute, i.e., the one closet in color. Thus, Campbell’s tomato soup would be good substituted for spaghetti sauce since they were both in the red pallet. At the school cafeteria, every third Thursday of the month they served lasagna. This was my favorite and I would rave about it to my mother. One day as I was headed off for school Mom grabbed me by the arm and with a smile said, “Gary, I’m going to have lasagna for you when you come home; I know it’s your favorite. I was so excited and couldn’t wait for school to be over. When I got home, Mom was in the kitchen cooking and told me that dinner would be ready at 6:00 so to go out and play until she called me. My brother and I played until Dad came home and 6:00 PM finally rolled around. I sat at the table and excitedly awaited for my Mom to emerge from the kitchen with lasagna. She came out carrying her rectangular glass Pyrex baking dish filled with something bubbling but it didn’t look like school lasagna. Mom’s version of lasagna consisted of Tomato soup mixed with Kraft’s macaroni and cheese and some hamburger helper. I was so disappointed and told her that lasagna has big flat noodles with ruffled edges and cottage cheese! As far as my mother was concerned, she had mixed, white, yellow, red, and brown together and put in a rectangular dish so it was lasagna. Based upon several experiences like this, I didn’t like food and was extremely thin for the first half of my life. Of course, some of us have experienced slightly different takes on this theme. There was the visit to the parent’s friends during the Christmas holidays (5 days after the holidays in fact) when a trip into the kitchen presented the holiday turkey that was still sitting on the cutting board – and was to be a part of lunch. Or there was the time that we learned from our former spouse about a special family delicacy which consisted of Wonder bread, topped with grape jelly and a piece of Velveeta cheese. 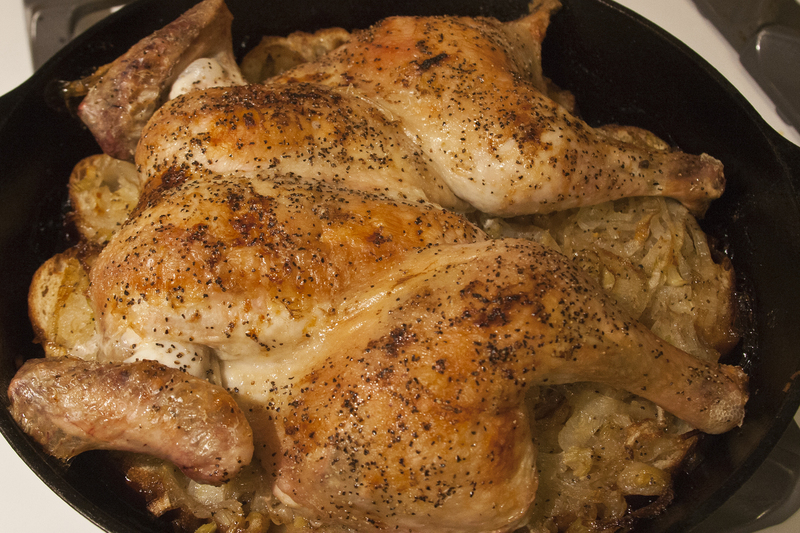 Once assembled, it was run under the broiler and served for dinner. And who can forget barbequed spam? While we don’t believe we inflicted anything quite this astounding on our children when they were young and impressionable, they probably have their own stories to share. Fortunately, we haven’t heard any of them. And a couple of easy recipes that require no cooking at all for you to enjoy with your mom, or in memory of her. The first is the result of some of the new produce showing up at the Dupont Farmer’s Market – French radishes and Persian cucumbers (Top Photo). The second is a recent addiction from the New York Times food section, thinly sliced cabbage mixed with avocado. For a change of pace, we will look at an oriental recipe along with some recent photos of the Darling of DC – Bao Bao. Many of us have become addicted to the fabulous Panda Cam at the Smithsonian National Zoo. We have been able to watch Bao Bao grow from something the size of a stick of butter into the rolypoly little girl she is today; now topping 20 lbs. We have seen her from inside the Panda Habitat where these photos were taken, but we look forward to seeing her outside very soon. Although she is still nursing, her diet has expanded to include bamboo (sorry, no recipes for that) and sweet potatoes, something we love and realized is lacking on this blog. We will get to work on that very soon. 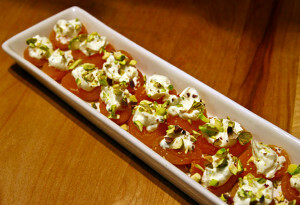 Allen was introduced to oriental cooking during the late 1970s while he was in California. He decided that he would try out the new cuisine when he was invited to prepare a dish for the chemistry department’s gourmet group. Since the host for the evening lived only a mile away, Allen decided that he would be able to stir-fry the meal at home, place the lid on the wok and serve the dish to guests upon his arrival. So, half an hour before dinner was to be served, he sliced the vegetables, grabbed the marinated beef and prepared the dish. Unfortunately, once he arrived at the host’s house, he realized that each person had been assigned one part of a multi-course meal – and it was supposed to be prepared in their kitchen. And naturally, the karma of the evening was such that the stir-fry was served at the end of the meal — about 1.5 hours after it had been cooked. 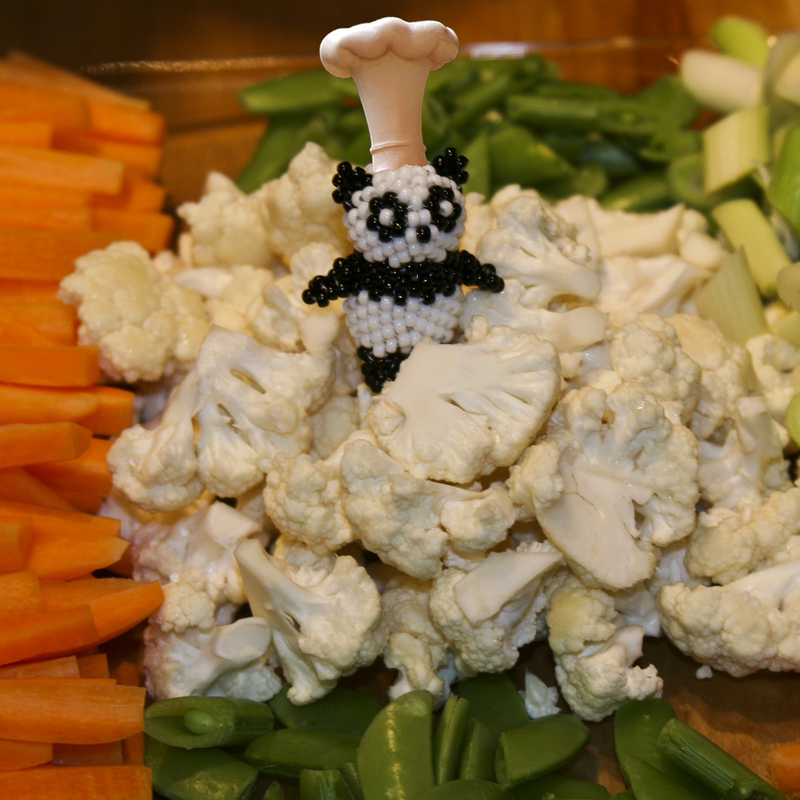 Needless to say, the vegetables were a wilted, discolored mass. The only comment made as this ‘delicious’ dish was served was made by a native Japanese who observed that oriental vegetables were supposed to be a little crisper when cooked. As they say, timing really is everything in cooking. Fortunately, we won’t suggest you recreate that special recipe, but perhaps this is one to enjoy at home – Kung Pao Chicken. 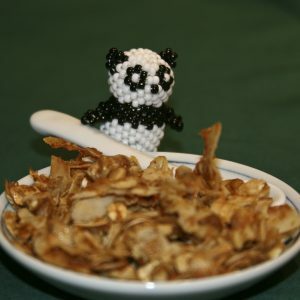 Today we want to introduce a product that started in our tiny DC kitchen, Kiss My Itch Goodbye®. The idea for an all-natural anti-itch product came about as most things do, serendipitously, but it was just too interesting not to give it a try. So several months later and after many experiments in the art of making lotion that is the right consistency and will not fall apart, a product is now on the market. 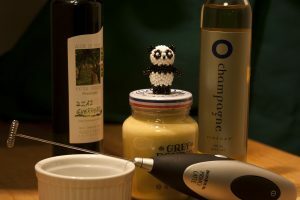 Unlike using a Julia Child recipe where she very carefully explained how to recover from a “broken” sauce, there are no rules that provide that type of recovery from “broken” lotion; only trial and error seem to apply. Originally, the intent was to find something that deals with the itch from insect bites but after testing by diligent family and friends, we have found the product is useful for so much more. Everything from “winter itch” to dermatitis, eczema, cracked fingertips and a variety of other skin problems responds positively to Kiss My Itch Goodbye®. And, not to leave anyone out, it also works on dogs. As noted in a February 17, 2014 article in The New York Times, “millions of people suffer from itching”; we hope this product will provide help to many of them. Please visit the web site to learn more if you are one of the many people who deal with itching. No surprise that we are not providing a recipe for this particular “dish” since it is currently going through the process for review by the patent office and soon, by the FDA. 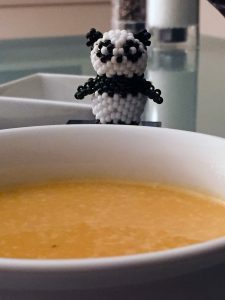 We, along with most of the country, are in deep freeze mode and while it is great for cold weather, we do realize you can only make and eat so much soup. It was time to branch out and one direction we took recently was the exploration of making ravioli with a little help from packaged wonton wrappers. 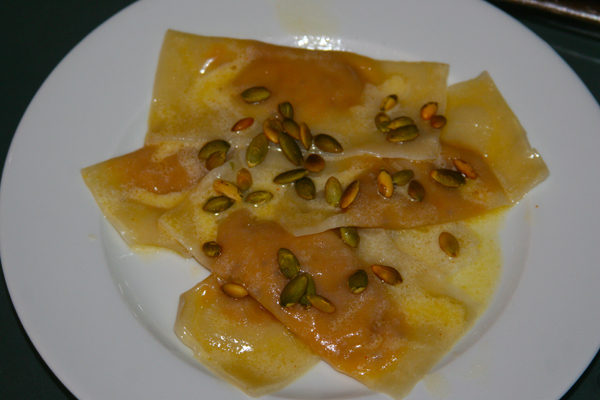 This pumpkin ravioli which has the easiest sauce ever created seemed like a nice winter dish so we picked up the ingredients and gave it a try. Preparing the filling and folding it into the wonton wrappers was very easy, but we weren’t sure the ravioli would hold together when it hit the hot water. After we got the water to a gentle boil, we dropped the ravioli in and found the filling stayed in place perfectly; in three minutes we had beautiful ravioli. The color (as you can see in the photo) is not particularly pleasing, but the contrast of flavors from the pumpkin filling, a crème fraîche sauce and toasted pumpkin seeds is lovely. We’ve made this a couple of times now and have decided that not only do we like it, we may branch out to a mushroom filling next. While dinner was great, it used only 15 of the wonton wrappers, so the question arises, what can you do with all of the wonton wrappers that are left (at least we didn’t buy the double package). Our daughter, Nicole, came to our rescue by pointing us to this great option for using them up. The original recipe calls for toasted sesame seeds as a topping but we have now expanded that to include toasted black sesame seeds, too. Next, we will probably combine both but either way, these are easy and delicious. 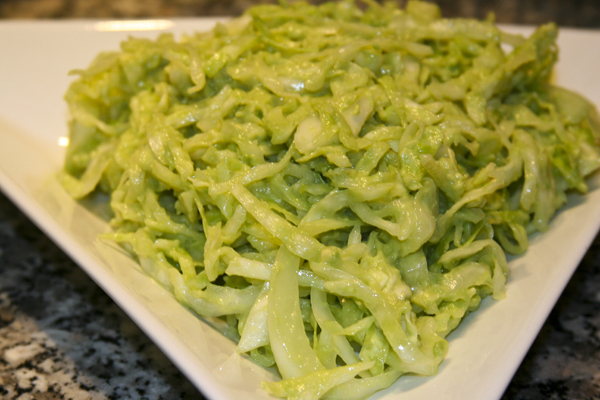 A great accompaniment to soup or a salad. 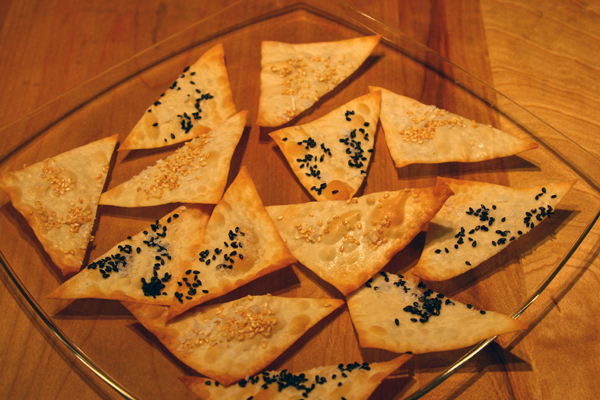 An update on the wonton wrappers… We tried them with a teaspoon of Z’atar seasoning added to the cornstarch along with a little extra oil; brushed it on the wrappers and once again topped with a little coarse finishing salt. Delicious! Up next will be some information on the other thing we’ve been creating in our kitchen. Although it isn’t edible, it is certainly useful to a large segment of the population.